The early childhood years (3 – 5) are a special period in the lives of young children. During this time, they begin to trust people outside their families. They gain independence and self-control and they learn to take initiative and assert themselves in socially acceptable ways. They become keen observers who experiment to find out what happens when they interact with other people and manipulate materials. Their language skills surpass the limited vocabulary and sentence structure of toddlers. The first component of The Creative Curriculum framework addresses how children develop and learn. This knowledge is one of the bases for planning the program, selecting materials, and guiding children’s learning. Understanding how children develop and learn means understanding the widely held expectations for children at various levels of development as well as the differences teachers will certainly find among individual children. Child development is divided into four areas: social-emotional, physical, language, and cognitive. In reality the four areas are closely related and often overlap. Development in one area affects and is influenced by development in all other areas. This reality requires teachers to pay attention to every area as they guide children’s learning. The second component of The Creative Curriculum framework is the learning environment: the use and organization of the space in the classroom and outdoors, the structure teachers provide each day, and the plans teacher develop. 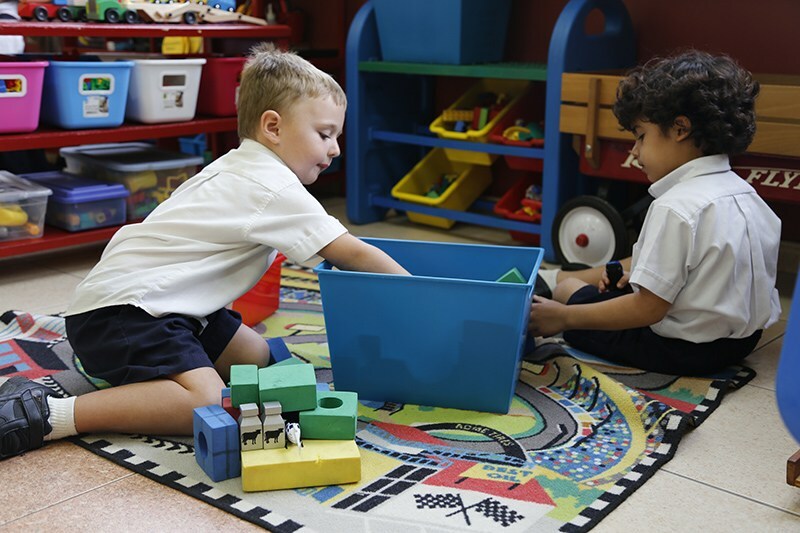 A well-organized classroom helps children make choices, encourages them to use materials well, and teaches them to take increasing responsibility for maintaining the classroom. A consistent well-balanced daily schedule gives children a sense of security, and the teacher’s plans enable them to be prepared for each day. The third component of The Creative Curriculum framework addresses what early childhood children learn in the content areas of literacy, mathematics, science and technology, social studies and the arts. Teachers integrate learning and make it more meaningful to children by engaging them in studying topics of interest. Mathematics - number and operations, geometry and spatial sense, measurement, patterns (algebra), and data analysis. Science – the physical properties of objects and materials, characteristics of living things, and Earth’s environment. The fourth component of The Creative Curriculum framework addresses two aspects of the teacher’s role that cannot be separated: caring and teaching. Everything the teacher does to create a positive social environment in the classroom; to promote children’s social-emotional skills; and to help them become competent, enthusiastic learners makes a profound difference in the way they experience school.